Tor Browser includes a “Security Slider” that lets you increase your security by disabling certain web features that can be used to attack your security and anonymity. 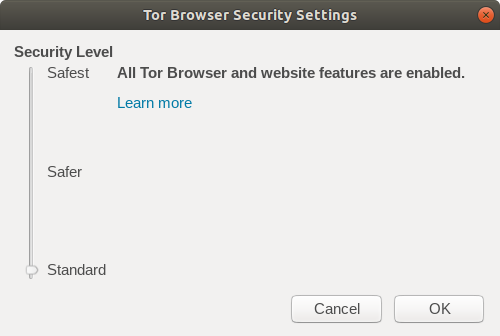 Increasing Tor Browser’s security level will stop some web pages from functioning properly, so you should weigh your security needs against the degree of usability you require. The Security Slider is located in Torbutton’s “Security Settings” menu. Increasing the level of the Security Slider will disable or partially disable certain browser features to protect against possible attacks. At this level, all browser features are enabled. This is the most usable option.